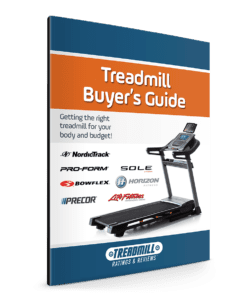 The NordicTrack Commercial x22i Incline Trainer is ON SALE! Can you watch TV on the 22″ display? You can not watch TV on the 22 inch display. Research tends to suggest the best motivation is a personal trainer and with the IFIT Live coach, you will definitely be motivated. Let me know if you have additional questions. The NordicTrack X22i goes up to 12 MPH so if you want to run it isn’t a problem. Can you use google on the big screen without having to subscribe to the iFit membership? Hi Jose, an active one year subscription is required when you purchase the X22i. 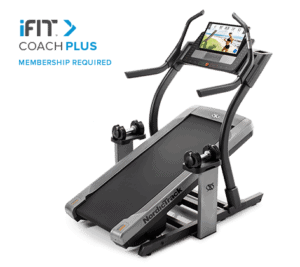 Currently, you can’t purchase the X22i without adding in the Ifit membership. I am hesitating between x22i and c2950. I am runner and need treadmill to prepare for Boston Marathon. I will be using it mostly for running. If you need the advantage of the steep incline the X22i will provide the best of both worlds (incline and running). 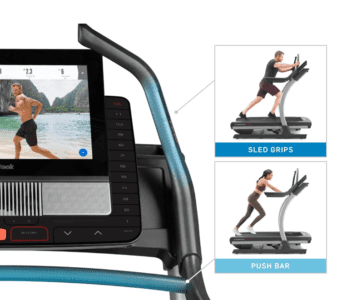 For the NordicTrack X22i, Regarding the one year ifit subscription, can my husband and I both use that subscription to “personalize our goals” or do we each have to buy our own? I live in an apartment and concerned about not disturbing my neighbors. How suitable is it for an apartment? I would think if it’s an apartment complex with neighbors underneath they will be able to hear you running/pounding on the machine. If there isn’t anyone under you, doubtful it’s an issue. Is the 22inch screen web enabled? Can I watch YouTube ? Does it have a fan? Does it have speakers ? I thought you got the Dumbells with the X22i? I am considering purchasing the X22i incline trainer. I see that iFit is included for the first year. What happens the following year if I am not interested in the iFit. I don’t think it is something I will want to use. There isn’t one at a store nearby that i can go see in person. Personally I don’t like the workout trainer videos or travel scenes (mainly because they don’t keep base with your speed) that come with the Peleton Bike and I am guessing this is similar. 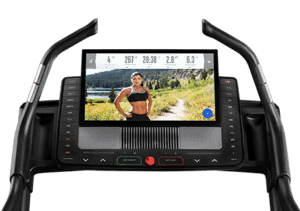 Is there an option for the screen to just show your workout progress or tempo/circuit like a typical treadmill? I wouldn’t want it to just be a black screen. I like to see how much time is left in my workout and calories burned etc. You will be able to use your machine without Ifit. Hello, looking at purchasing the x22i. Wondering if the platform is long enough to do the push sled bar without feeling like your stride is cut short or your feet falling off the back. 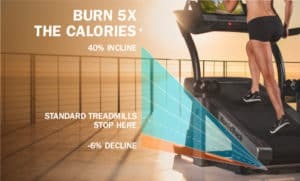 Any users have a problem with the length of the treadmill? We’ve not received any negative feedback from the deck length when using the sled push.